I prefer a smaller sink. Color is also darker than I thought it would be. Quality is good. Meet the Wallace copper sink. This bath sink is designed for everyday living to fit many applications and design styles. This handcrafted and hand hammered bath sink is made from 99.9%, 18 gauge, pure solid copper by Sinkology's team of skilled artisans. The Wallace features a Dual Flex rim, making it perfect for either an undermount or drop in style installation. 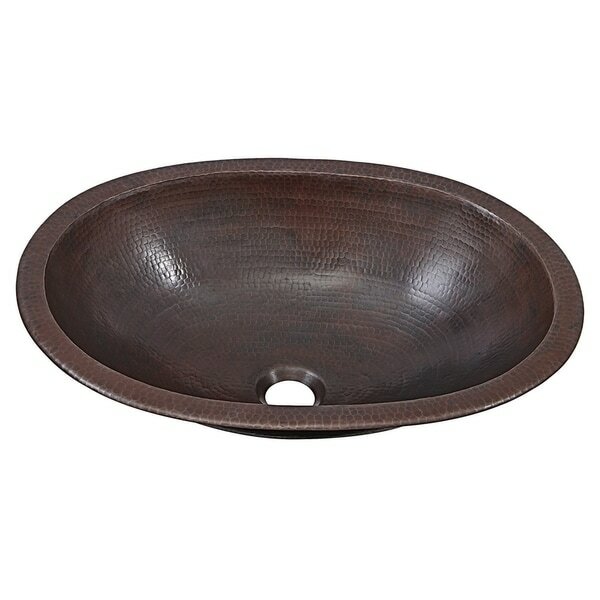 The functional and beautiful design of the Wallace copper sink makes this bath sink a great buy and adds a strong point of pride in your home. 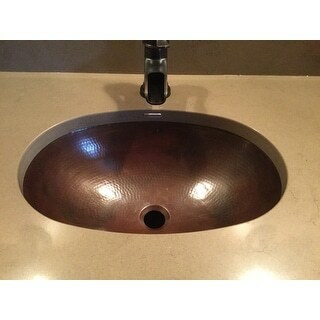 18 Gauge Pure Solid Copper Sink, ensures a lifetime of durability. Outer Dimensions: 19" x 14" x 5.5"
Inner Dimensions: 17" x 12" x 5.25"
Dimensions 19.0 In. X 14.0 In. X 6.0 In. Love this sink it is beautiful. Our only issue is that a typical pop up drain doesn't fit. The copper is thinner at the bottom than a traditional sink so it doesn't fit tight. I wish that this would have been mentioned when purchasing the sink. I would have just purchased them together. I have ordered one from Overstock that I hope will fit. It was recommended to another customer in the question section. The sink is so beautiful it's just an inconvenient delay to now have to wait for a special drain. Our remodel project is finished but we can't have an inspection until the sink is finished. I would still recommend this sink just be aware of the drain issue. 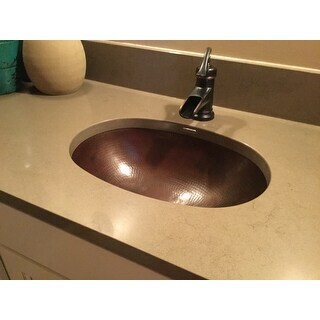 Nice sink - my first one was stolen from my front door. Overstock was amazingly helpful with replacing it. No hassle, friendly customer service. Very good quality. Looks as good as in picture. Very happy with product and price. "What are the dimensions of the cut out for the sink?" "I am a little confused about the dimensions of this sink. Could you please tell me what the measurement, in inches, is of the length and width of the actual bowl. I need a precise size in order to know if it will fit into my vanity. Much appreciated!" The outside dimensions are approximately 19 inches wide x 14 inches long x 5.5 inches deep. The interior dimensions are approximately 17 inches wide x 12 inches long x 5.25 inches deep. There were many sinks that appeared to be about the same, but this one had the exact dimensions I needed. I can't wait to see it installed in the vintage oak sideboard that will be the new bathroom vanity in my farmhouse. Has nice copper features. Description said it was pure solid copper. Liked the color and texture. "Which pop up drain fit this product?" Hello June Chung K., you will need a 1.5 inch drain. Here is one that would work great ITEM# 14003957. Thank you for shopping with us!